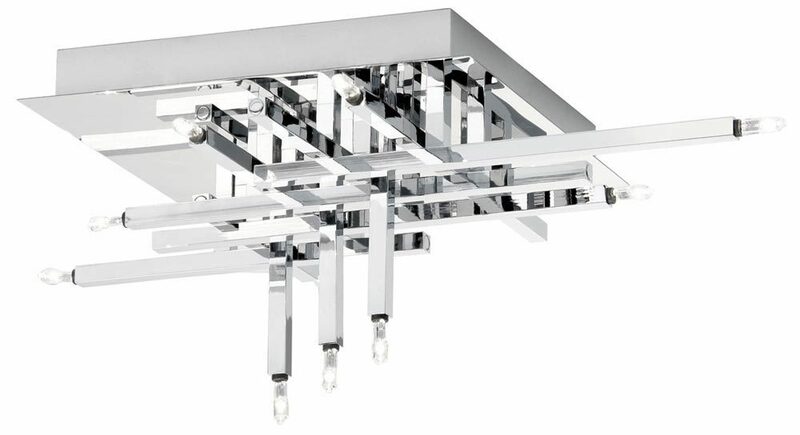 This Lattice modern polished chrome 11 light flush fitting ceiling light features a unique and stylish criss-cross pattern. The lattice style fittings are of different lengths, and lay at right angles to each other in an intriguing futuristic style pattern. Perfect for any modern bedroom, living room, dining room or kitchen, this contemporary chrome finish fitting provides a talking point, as well as eleven individual lights to brighten the room. Rectangular mirror polished chrome ceiling mount, with square section lamp holders that cross over horizontally and vertically to create a three dimensional pattern. The arms and lamps reflect from the mirror ceiling mount to give extra illumination and create a wonderful feature. Supplied by Searchlight who manufacture some of the best traditional and modern classic designs such as the Lattice modern polished chrome 11 light flush fitting ceiling light you see here.